Current theatre built by Alberto Bourdon. Opened 1936. Used for all kinds of theatrical performances and as a cinema. 1998 renovations. 2500 seats. 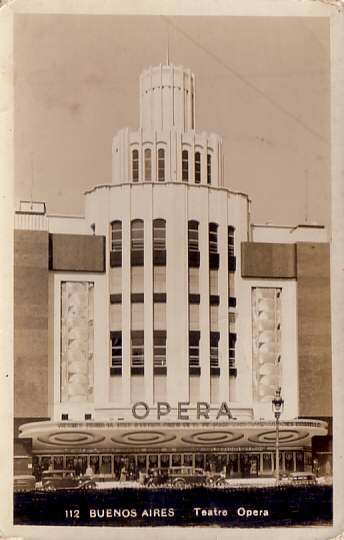 Later also known as "Opera Allianz" or "Ópera Orbis Seguros" after various sponsors. Stamped Reverse Text: "Paul Grösche, Musiker, Dresden-N."
For another image of this theatre, see Buenos Aires: Cinemas in Calle Lavalle and Avenida Corrientes.